Too many of our ideas about entrepreneurs come from the lives of tech billionaires. Although each and every country has its local entrepreneurial heroes, much of the mythos around who is an entrepreneur today and what it takes to support entrepreneurship is based on Silicon Valley stories. Many countries have implemented public policies to try to create their own equivalent of the San Francisco digital powerhouse, but the legends we have of entrepreneurs nowadays are often still based on famous billionaire tech founders such as Bill Gates, Steve Jobs and Jeff Bezos. A lot of our preconceptions about entrepreneurship implicitly build on the assumption that people are driven to maximize individual economic utility, and act opportunistically, sometimes at the expense of others. However, the world is fundamentally – and maybe irrevocably – changing, and demands we rethink what entrepreneurship ought to be about in the future. Generation Y (born in the 80s and 90s) and generation Z – the post-millennials, born in the late 90s and early 2000s – want to make the world a better place, and believe that business methods are the best way to do so at scale. They see business leaders having deeper impact on society than religious and political leaders, and they desire organizations to shift from inordinately focusing on generating profit to balancing social and environmental concerns and making their impact on society a more positive one. Secondly, dealing with some of the pressing issues we’re facing in today’s societies, such as climate change and global warming, rising inequality and poverty alleviation, pose major challenges for governments and businesses around the world while providing market unpredictability. These challenges suggest a need for novel models, methods and solutions which present opportunities for entrepreneurship and start-ups to simultaneously mitigate the causes of these issues, while also addressing and solving their negative effects. 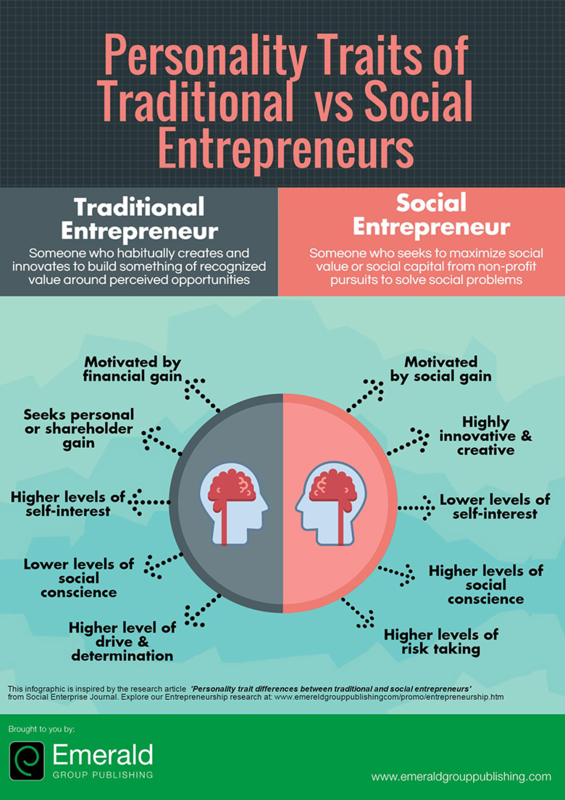 A comparison the traits of traditional and progressive entrepreneurs. As such, these trends require a shift in focus that goes beyond the conceptualization of entrepreneurship as solely centered around financial opportunities and profit maximization, to entrepreneurship turbocharged with a purpose, targeting broader societal or environmental goals, such as the UN Sustainable Development Goals. In light of this, we can start to imagine a future where entrepreneurship is not just a career choice or a means to make money, but a catalyst to drive the transformation that is needed to meet some of the grand challenges we’re facing today. The benefits of these new ideas however, cannot come only from Silicon Valley legends. Instead, they must arise from the creativity and pragmatic energy of entrepreneurs working around the world, from Africa to China to Latin America and India, whose approach will build on, evolve and challenge the current thinking. Furthermore, in order for entrepreneurship to be geared towards global problem solving, we must re-examine some of the assumptions underlying our current systems and models that foster entrepreneurship. First, including socioeconomic and environmental goals – which are often perceived to come at the expense of financial returns – requires us to determine what incentivizes people to engage in entrepreneurial initiatives and endeavours. How can we help new entrepreneurs develop the skills and talents necessary to think about creating positive change – and also, how can we make it relevant and attractive for other stakeholders, including funders, customers, employees, governments and policy-makers? Second, leveraging entrepreneurship to address global problems can be paradoxical in nature. Many of the challenges, ranging from climate change to social justice to universal healthcare, are highly complex and interconnected, yet at the same time context-dependent and local. How can we strike the right balance? How can we develop new models or frameworks to define and stimulate entrepreneurial ability that is able to embrace the dual (global versus local) nature of these grand challenges? We need to understand how we can develop global and local ecosystems to create, upscale and sustain such entrepreneurial endeavours. Specifically, as power migrates from national to the city level, it forces us to think about how we can grow such ecosystems while embracing the cultural and regional specificities of cities around the world. We must reflect on how to (re)enforce linkages between economies, countries and continents that enable us to leverage our local knowledge, resources and skills to fuel entrepreneurship that addresses global social and environmental challenges. We must also figure out how this translates into the design of specific policy measures and programmes to nurture entrepreneurial talent for the greater good. These are some of the questions and issues we have set out to explore within the Global Future Council on Entrepreneurship.